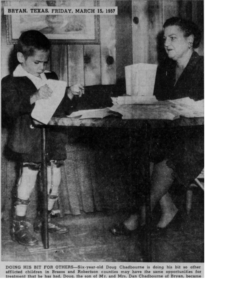 In 1945, the College Station Kiwanis Club appointed a Crippled Children’s Committee. They served tirelessly through the years, organizing and making arrangements for an annual clinic for crippled children and adults. The Clinic served an 18 county area centering around Brazos County. The first of these annual clinics was held May 23, 1945 at the old College Hospital. Five doctors, all specialists, traveled from Galveston Medical School to give their services for free. 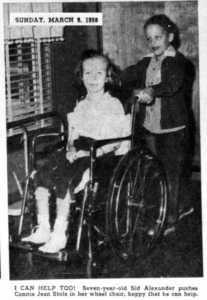 The Crippled Children’s Clinic served 95 clients its first year and continued to grow each year thereafter. These early efforts gave rise to Brazos County Crippled Children’s Society. 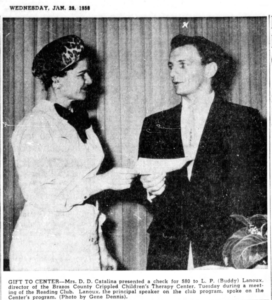 In June 1956 Mr. and Mrs. Danville Chadbourne contacted Mr. and Mrs. J.O. Alexander, Jr. knowing of their interest in children with disabilities. Both families had children with cerebral palsy. The two couples met several times to discuss the possibilities of a local therapy center. The Chadbournes were taking their son, Doug, to Waco, while the Alexanders took their son, Sid, to Austin regularly for therapy treatments. Wondering how many other parents had to travel such distances for treatment for their own children, the Chadbournes and Alexanders sought out others in the same situation. More and more they realized there was a definite need for a local treatment center. 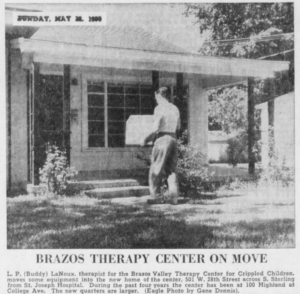 Knowing the Brazos County Society for Crippled Children had long dreamed of a treatment center, the four parents met and discussed the problem with the Society and were given permission to pursue their plans further, with the full support of the Society’s President and Board of Directors. Taking a very positive attitude, this small group set out to decide just how much they could depend on the general public to support a center and to get the approval and opinion of the Brazos-Robertson Medical Association. The first community contact was a speech to the Evening Lions Club explaining the needs for a center in this area. The publicity from the talk was instrumental in initiating the establishment of the Therapy Center in Bryan. Speech after speech to other social, civic and church groups was made by the two men (Alexander and Chadbourne). Numerous inquiries by their wives soon seemed to pay off. All the groups received the idea with great enthusiasm when it was explained how the work of the Therapy Center would aid the crippled children of this area. The public as a whole was not aware that so much could be done for the children, nor did they realize that such a number of these children lived in and around Bryan-College Station. The Center would actually serve Brazos and the surrounding counties. When the Brazos-Robertson Medical Association gave unanimous approval of the plans, this was felt to be the start of the Therapy Center. Soon donations from individuals, clubs, and church groups began coming in. With this brighter view and encouragement given to the Brazos County Society for Crippled Children, the Board of Directors for the Brazos County Crippled Children’s Therapy Center was formed. This took place in May 1957. The following committees were appointed: Finance, Housing, Therapist. The late B.F Vance, Mayor of Bryan and his Finance Committee were very successful in securing pledges in the amount of $2,400 for the assurance of the operation of the Center for at least one year. The Housing Committee chose a white framed house at 100 Highland, midway between Bryan and College Station for the first location of the Center. The Therapist Committee chose Mr. Leonard P (Buddy) Lanoux, a Registered Physical Therapist as the new full-time Therapist-Director for the future center. Organizational work for the Center began when he moved to Bryan in July of 1957. That month was spent remodeling and redecorating the new Center and scheduling appointments for therapy treatments. The first actual treatment was given on August 1, 1957. This proved to be a very encouraging start for the Center. The patient load for the month of August numbered but thirteen. This small number stirred the interest of the public in that many came by to see and visit the new Center to attain an understanding and knowledge as to what therapy was. Bryan-College Station had never had a therapist before this time. The Board of Directors proposed the By-laws for the Center in November, 1957. After this, an application for a charter was filed with the Secretary of State of the State of Texas. 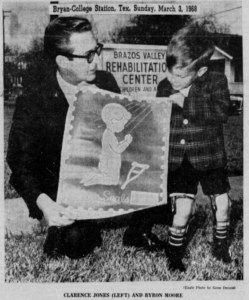 This was approved in February 1958 and the Brazos County Crippled Children’s Therapy Center officially became a non-profit, non-tax supported charitable organization. Various civic clubs, church groups and generous individuals aided in the financial support of the Center. 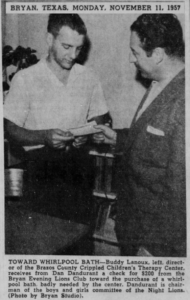 In September 1959 the Center felt the need for expanding the kind of services offered. Mrs. Shirley Frazier, a Certified Speech Therapist was employed on a part-time basis. This gave the Center two types of therapy services for the crippled children of the area. The Board of Directors saw the need for expansion, and a larger building site was sought and found. In May 1960, the Center moved to 501 West 28th Street, across from St Joseph’s Hospital in downtown Bryan. Still, new demands arose in 1963. With expanding community needs, the Medical Advisory Committee of the Center recommended to the Board of Directors that Physical Therapy services be made available to adults in the community. At the same time, in cooperation with the Bryan-College Station Area Council for Retarded Children, the Board approved a motion to create a pre-school aged Kindergarten at the Center. Through the ongoing activities of the Board of Directors along with continued financial support from the community, the increasing demand for services was answered. First, the Center built a new facility with 3,900 square feet at 3300 East 29th Street in Bryan in 1969. Subsequently, expansion of services continued and through the guidance of Executive Director, Jim Thompson, the Center moved into a new, up-to-date, two million dollar plant at 1318 Memorial Drive in Bryan in 1984. The modern facility enabled the Center to provide the latest, state-of-the-art rehabilitation services including physical therapy, occupational therapy, speech pathology, audiology, social/psychological counseling, neuropsychology and orthotic services. Today, with the support of the community, volunteers and staff, BVRC continues to serve the children and families of the Brazos Valley.